Just as Facebook CEO Mark Zuckerberg predicted, the world is becoming more social. 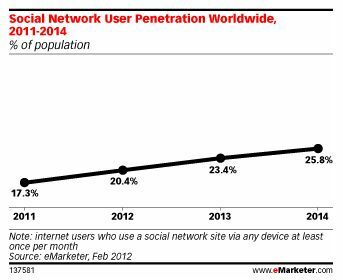 There will be 1.43 billion social network users in 2012, a 19.2% increase over 2011, eMarketer predicts - amounting to a substantial share of the world’s entire population. 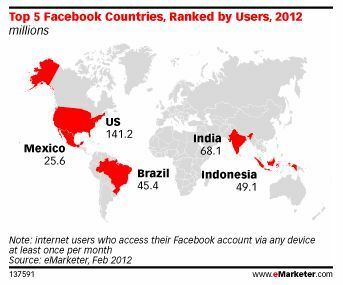 Three of the five top social networking markets in 2012 are also among Facebook’s largest markets - the US, India and Brazil. But the absence of China and Russia from the list means Facebook still hasn’t conquered the world.